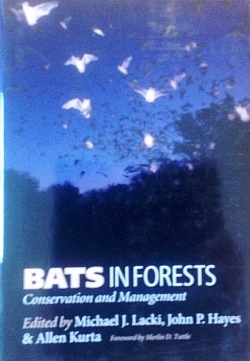 Bats in Forests Conservation and Management edited by Michael J. Lacki, John P. Hayes, and Allen Kurta foreword by Merlin D. Tuttle 2007 352 pp., 2 color illus., 32 b&w photos, 12 line drawings. Hardcover. Although bats are often thought of as cave dwellers, many species depend on forests for all or part of the year. Of the 45 species of bats in North America, more than half depend on forests, using the bark of trees, tree cavities, or canopy foliage as roosting sites. Over the past two decades it has become increasingly clear that bat conservation and management are strongly linked to the health of forests within their range. Initially driven by concern for endangered species--the Indiana bat, for example--forest ecologists, timber managers, government agencies, and conservation organizations have been altering management plans and silvicultural practices to better accommodate bat species. Bats in Forests presents the work of a variety of experts who address many aspects of the ecology and conservation of bats. The chapter authors describe bat behavior, including the selection of roosts, foraging patterns, and seasonal migration as they relate to forests. They also discuss forest management and its influence on bat habitat. Both public lands and privately owned forests are considered, as well as techniques for monitoring bat populations and activity. The important role bats play in the ecology of forests--from control of insects to nutrient recycling--is revealed by a number of authors. Bat ecologists, bat conservationists, forest ecologists, and forest managers will find in this book an indispensable synthesis of the topics that concern them. "This well-referenced work will be of value to readers interested in bat biology, ecology, conservation, forestry, and land management." --Choice "I highly recommend this volume to anyone who is interested in bats. Professionals working with bats... will find the volume very useful, from the extensive citations to literature to thoughtful advice from experienced authors."--M.B. Fenton, Quarterly Review of Biology "A good pick for any college-level library strong in natural history and conservation issues." --Midwest Book Review "Fills important gaps in the scope of the earlier symposium... comprehensively reviews the issues and research tools currently available for addressing bat-forest issues anywhere in North America." --Elizabeth Pierson, Bat Research News "This volume will be valuable for land and forest managers as well as researchers and students concerned with the 27 bat species that inhabit the forests of North America." --C.R., Northeastern Naturalist Michael J. Lacki is a professor of forestry at the University of Kentucky. John P. Hayes is a professor and chair of wildlife ecology and conservation at the University of Florida. Allen Kurta is a professor of biology at Eastern Michigan University.